No Full Moon in February! Move your clocks ahead 1 hour in Spring and back 1 hour in the Fall ("Spring forward, fall back"). The 2013 Winter Solstice was Dec. 22, 2013.The Summer Solstice is June 21, 2013. How Did You Find Out About the Moonbow? 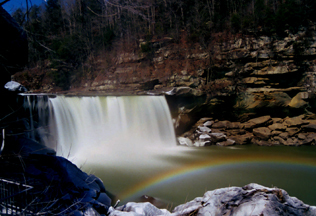 This is the waterfall in Kentucky that creates a moonbow when the moon is full or strongly lit. Click on the above link to find the date. The first full moon of 2018 on January 1, will be what is now called a supermoon. The supermoon is now an informal term for a full moon seen near the Moon's perigee, when it is closest in orbit to Earth. The January 31 full moon will be a near perigee Full Moon and also a Blue moon because it will be the second full moon of the month! several things must happen. Good weather, water temperature, sufficient rising mist, wind speed and direction, water clarity, a clear sky, water volume and some moon light. It may occur before 2 days on or after certain Full Moons or any strongly moonlit night. The moonbow happens monthly if the weather, water and astronomical conditions are right. Lots of weird and bizarre science in the United States of America! Click on the lines below for accurate Dates, Sunset and Moonrise Times and Lunar Schedule to figure the best moonbow viewing time. Other Future Perigee "Super Moons"
"30 years spent in pursuit of the feeling of ambient night"
The Full Moon rises at sunset. The Native Americans who lived in the area kept track of the seasons by giving a special name to each recurring moon. The name was used the entire month in which it occurred. The Harvest Moon , the full moon nearest the autumnal equinox, ushers in a period of several successive days when the Moon rises soon after sunset. This phenomenon gives farmers in temperate latitudes extra hours of light in which to harvest their crops before frost and winter. If the Harvest Moon falls in October, the September Full Moon is referred to as the Full Corn Moon. This year's Harvest Moon will be September 24, 2018. The next Full Moon after Harvest Moon is called the Hunter's Moon. It is accompanied by a similar but less marked phenomenon. Visit ColorFall for the peak foilage for colorful fall photos. Equinoxes are days when night and day are of equal length marking the start of a new season. -First Day of Spring - Spring Equinox March 20, 20118 - Fall Equinox Sept. 23, 2018. Equinoxes occurs twice a year, around March 20th and the 23rd of September. This is simplified, but incorrect, understanding of the Earth's orbital motion can lead up to errors up to 69 seconds from the actual time. of the equinox. First Day of Summer-Summer Solstice - longest day of the year- June 21, 2018. First Day of Winter -Winter Solstice - It will be the shortest, darkest day of the year. In the northern hemisphere it occurs when the sun is directly over the Tropic of Capricorn. - December 21, 2018. The same can be said about the dates for solstices. The Moon is moving away from the Earth at about 1.6 inches a year ! The Moon in position for a Lunar Rainbow, peeking over the ridge and tree tops. Blaming the Full Moon for Sleep troubles may not be lunacy. The Lunar New Year of 2018 starts on January 1, in some cultures and celebrated over a two-week period. The Honey Full Moon of June will fall on Friday the 13th. This is a rare event. Moonbows occur on the opposite side of the Moon and inclined to look white to the human eye. This is due because their colors are not bright enough to be perceived by the receptors in the human eye most of the time. It is possible to view the colors in a moonbow using long exposure photography. It is also possible to see colors in the moonbow with your eyes, during certain conditions. This depends on how you perceive the moonlignt. They appear as very light pastel colors. My little trick...If I can see my shadow from the Moon, it's bright enough. The best time to see the moonbow is just after the moon has cleared the ridge looming over the falls. It is usually visible about an hour after night fall beginning two nights before a full moon. Then, add about 30 minutes for each day, since the moon, during its phase, rises progressively later. Celebrate Moonbow Nights in Corbin. They will be held three nights downtown at Nibroc Park, with the first one starting at 5 on Saturday, May 17. Two other Moonbow Nights will be held Saturday, June 14, and Saturday, Sept. 6.p.m. Visit the moonbow during the next Moon Bow Days & Nights and Lunar Rainbow at night in Corbin , USA here on earth. When there is a Full Moon here, there is a full moon everywhere on Earth, including Yosemite and Victoria Falls, Africa. A series of Lunar Eclipses will be a Total Eclipses in 2014 though 2015, starting with the "Blood Moon"